Deadline is Wednesday, March 15th, 2017. Please note that the deadline has been moved earlier to Wednesday, March 29th! Awarded to youth who have faced adversity and have not only risen up against the odds, but are demonstrating a commitment to continue their education. This award is open to students who have faced challenges like poverty, health, family issues, personal loss and lack of support. Please note that we have had Byrne students receive this award in the past… it is in your reach! Your story of determination deserves to be celebrated. Write your essay in such a way that the committee can see that you are the best candidate. Submit your essay to Ms. Falsetto by Wednesday, March 29th. The Byrne Creek Scholarship Committee will select our nominee. Once all of the applications are received, the Burnaby District Scholarship Committee will select the recipient. If you’ve been selected, you will be notified by your school by June 30. St. Mark’s is the Catholic Theological College at the University of British Columbia. All scholarships, bursaries and grants listed below are available for students in the St. Mark’s College Bachelor of Arts program. Students who demonstrate outstanding academic achievement and Catholic leadership. Students with English as a second language. Students who demonstrate active involvement in social justice causes. Students who demonstrate academic excellence and service in Catholic faith life and activities. 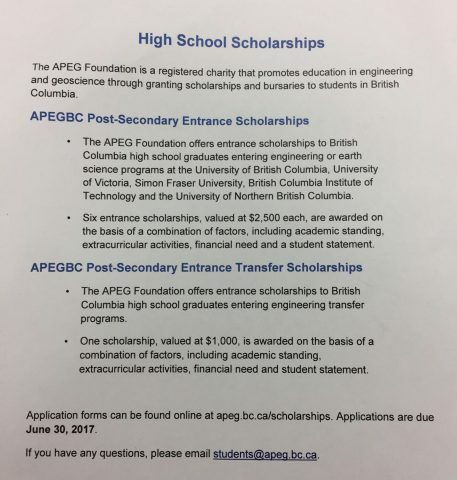 Application forms can be found at http://www.apeg.bc.ca/scholarships. Is your passion in DANCE, DRAMA, MUSIC, visual art, theatre, script writing, stagecraft, directing or media arts? If yes, apply for the Michael J. Fox Scholarship! Please note that the Byrne Creek deadline is Friday, April 6th 2018 to Ms. Falsetto. The amount for this scholarship has not been determined yet… stay tuned! There is over $10,000 available. Submit your essay via online application form HERE. Click the link HERE for more detailed information. Deadline is Thursday, June 1st, 2017. 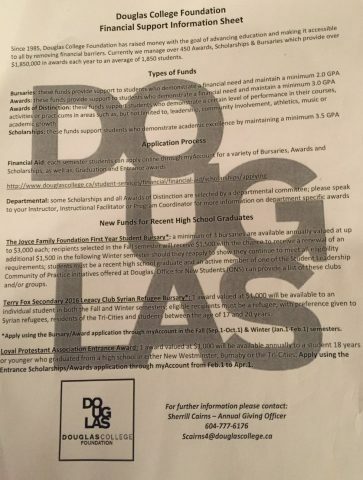 Financial support information for Douglas College HERE. KPU has scholarships available for the Fall. They are also offering Aboriginal Entrance Scholarships for $5000 as well as KPU Major Entrance Scholarships for $20,000 and $5000 for students who are taking classes for the first time at Kwantlen in Spring 2018. More scholarship information is available HERE. 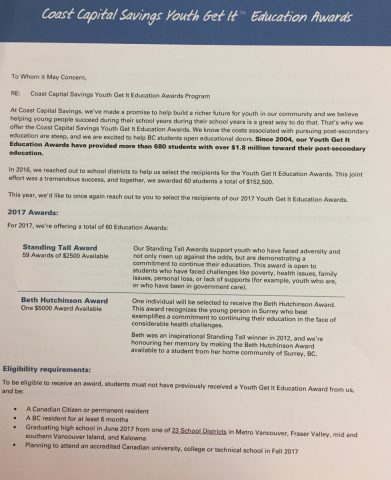 The following district bursaries/scholarships are available for Burnaby Secondary School Graduates and are valued from $100-$2500. You may apply for more than one of the following scholarships as long as you meet the stated criteria. Please READ the specific criteria for each scholarship or bursary before you apply. All applications must be submitted to Ms. Falsetto before Friday, April 6th, 2018. Please remember: NO STAPLES, ONLY PAPERCLIPS where necessary. All of these applications require a “cover” application form HERE. Then, attach the information that the scholarship requires. The applicant must be enrolled or have been accepted to an accredited post-secondary educational institution, and demonstrate his/her intention to pursue full time studies. “Post-secondary” includes trade school or other specialized education as determined by Committee. The applicant must be a rugby player who has played for the Burnaby Lake Rugby Club (“BCRC”) in the past or is registered to play for the BLRC in the upcoming season. Men and women are eligible to apply; there is no age criteria. The applicant must have demonstrated a commitment to the rugby community and/or the community at large through volunteer commitment and effort. Deadline is February 28, 2017.